VANCOUVER -- For most longtime members of the Vancouver Canucks, BC Place has been little more than the large, mushroom-topped stadium they drove past almost daily on the way to the rink. Defenseman Kevin Bieksa is one of the few who has been inside BC Place as a centerpiece on the world stage, a spectator at the opening ceremony for the 2010 Vancouver Olympics. So Thursday, when the Tim Hortons NHL Heritage Classic launched and a chance to envision BC Place as an outdoor hockey rink for the first time, Bieksa had the best idea of how special it can be. "I got to experience it and it was unbelievable," said Bieksa, who was here in February 2010 due to an injury while the rest of the Canucks were on a road trip when the Olympics opened. "The energy in the building was amazing, you could feel it." There was a sense Thursday of how similar things might feel when 55,000 fans pack BC Place for the March 2 game against the Ottawa Senators. 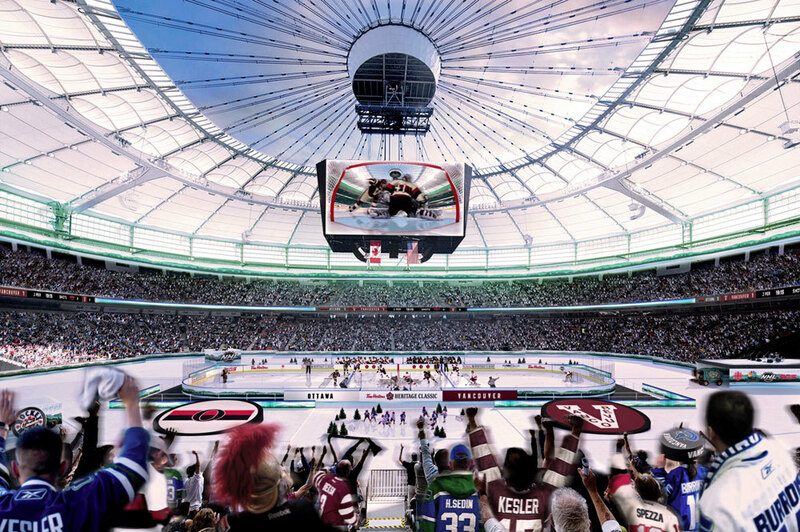 There is, however, one major difference since the Olympics: That old mushroom-shaped dome was removed during a $563 million renovation, ensuring the first NHL game held in a retractable-roof stadium will be an outdoor experience. It sure felt that way Thursday, with the sun shining through the large opening and a cool wind funneling down that made it feel colder than 34 degrees Fahrenheit. "This weather right now would be perfect," Canucks forward Daniel Sedin said. Significant rain on game day might force the roof to be closed. But after experiencing BC Place for the first time with the rink outlined in the middle of the field, and looking up at the seats that will be packed with a crowd three times the size the Canucks routinely play in front of at Rogers Arena across the street, there was a sense the third NHL Heritage Classic will be a must-see spectacle. "Playing in front of 50,000 fans, the atmosphere will be amazing," Bieksa said. "Most of us grew up learning how to skate outdoors. We've been watching these games for a few years now and chomping at the bit hoping we could get into one." Ryan Kesler, who watched past outdoor games, said he didn't get a feel for what it might be like until he arrived at BC Place and started looking around. "It sets in when you walk into the building," said Kesler, who did not take part in the 2010 closing ceremony hours after his U.S. team lost the gold-medal game to Canada. "This is pretty incredible." The NHL is working to share as much of that experience as possible leading up to the 2014 Heritage Classic through its all-access television series, "NHL Revealed: A Season Like No Other." There was a sneak peak at this press event, with clips of Canucks forward Dale Weise in a panic because he couldn't find his helmet, which had been hidden by a teammate, minutes before a recent practice, and coach John Tortorella lighting up his team between periods of a win against the Senators the next day. Fans interested in more information on ticketing, further news and special offers around the event should register right now to receive more information at nhl.com/2014heritage. Official fan packages for all NHL signature events are available from Global Event Forum, the Official NHL Events Fan Package Partner. For more information please visit nhl.com/fanpackages. 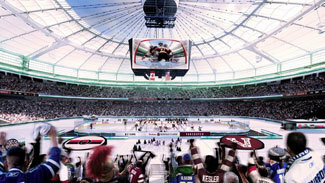 As a supporter of the 2014 Tim Hortons NHL Heritage Classic, the 37 downtown hotel members of the Vancouver Hotel Destination Association will be featuring great prices on their booking site at bevancouver.com. For John Collins, the NHL chief operating officer, that kind of unique inside access is a big part of making events like the Heritage Classic a true community experience, one that extends well beyond Vancouver. "These moments are valentines to the fans, to let them into the game and see how special it is and see how special the guys in it are," said Collins, who announced 2,000 tickets for youth hockey players around Vancouver. "How can we really celebrate the game in an iconic and major way? We bring the whole community together." What better way to do it than with an outdoor game, which had hardened NHL players reminiscing Thursday about their youth, smiling and playfully trash talking as they shot pucks through the football uprights. That included usually stiff-lipped Kesler, who topped everyone by splitting the goal posts with a wrist shot from 70 yards. He then talked fondly about the backyard rink his dad built and playing on frozen lakes around Michigan with his uncle and brothers. Kesler said he believes the 2014 Heritage Classic may top them all. "It's going to be a special moment in my life I won't forget," he said.